K Bethany Sawyer > Free Story! Originally written for the Quantum Shorts 2013 competition, this story is significant to me for several reasons. First, I found out about the contest four days before the deadline, and am very proud of what I was able to create in that time. Second, my friends and publishers Russell & Morgon Newquist liked this character enough to request another installment for their anthology Make Death Proud To Take Us. I could say more, but then my intro would be longer than the story . . .
Sheriff Bell re-read the witness accounts from yesterday’s skirmish. Something didn’t add up; an element was missing. It wasn’t that he didn’t trust the girl, her grandmother, or the hunter. Remarkably, their tales were so consistent that he had no reason to doubt the veracity. Nor was it overly alarming that a shape-shifting wolf-woman had evaded detection and run amok amongst the townsfolk. Strangeness was a common occurrence in his village, and more peculiar things had happened here. No, it was a matter of size. Even assuming this creature had an expanding stomach that, like snakes, allowed it to devour creatures larger than itself, how could it have swallowed both the grandmother and the child, yet remain small enough to appear as a “slightly larger than normal wolf” to the woodsman? Why was it that the grandmother spoke from the child’s perspective – and vice versa? And what had happened to the little girl’s red shoe? Once again, the sheriff retraced the child’s route through the woods, paying closer attention to the section of trail through which the hunter had observed the beast stalking her. This time, he found what he was looking for: a tiny trail that paralleled the main road then turned upward into the hills behind town. The path ended at the mouth of a cave. After peering through the entrance to ensure the cavern was empty, Bell entered cautiously. Inside, he discovered a strange laboratory. To his left stood two cylindrical tanks, tall enough for a man to stand in but empty save for clear goo seeping down the sides. In the center, a cardboard box rested on a large table; hand-written in marker were the words “Cat inside. 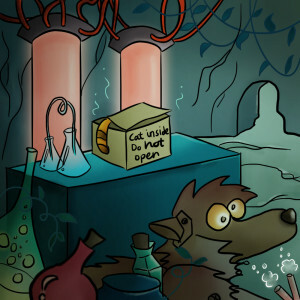 Do not open.” To the right, and of greatest interest to the sheriff, the body of a wolf lay haphazardly on the floor. On examination, the sheriff discovered that this wolf, though robotic, matched the description the hunter had given. Mechanical pets weren’t unusual in these parts; the hole in the wolf’s stomach, however, was. At the far bottom of the stomach – further than Bell could reach – lay a tiny red shoe, covered in clear goo. Bell considered the puzzle. Clearly, the wolf’s stomach was a portal to some other place. But where? It seemed to be a two-way connection; the hunter had been able to pull the girl and her grandmother out. If he found the place, and the shoe, he would better understand the wolf’s motives. It hadn’t been looking for food. He investigated the rest of the lab. 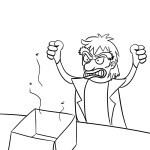 Inside the box, he discovered the rotting corpse of a dead cat. Horrified, the sheriff took off his coat, wrapped the body inside, and put the parcel under his arm to take to the pet cemetery for proper burial. He then crossed the room to examine the tanks. Inside one of them, on the bottom and partially covered in incandescent goo, he found the red shoe. Bell glanced back at the body of the wolf, then looked more closely at the tank. As he examined it, a noise came from the other side of the room. Bell stepped behind the tank and watched as a large, grotesque, yellow-haired man in a lab coat walked in, muttering to himself. The man stumbled around, stubbed his toe on the wolf robot before kicking it to the side, then staggered to the table where the box lay open. His eyes narrowed. “Someone has opened my box,” he growled. He stepped back and scanned the room. Bell saw no reason to delay the inevitable; he came out from behind the tanks. “That would be me,” he said confidently, putting one hand on his stun-gun, just in case. Assuming he meant the wolf, the sheriff replied, “No, that wasn’t me.” He stood still, holding his ground as the mad scientist continued to advance. “Yes, you can!” the madman growled and, with a fantastic leap that startled Bell, he pushed the sheriff into a tank and sealed the door. A clock next to the dials began a countdown, starting at 60 seconds. The madman stepped into the adjacent tank, and finally Bell understood. The confusion between the grandmother and granddaughter hadn’t been shock. Somehow, this strange scientist had made the younger one look older and the older one look younger! And now, he intended to perform the same procedure on the sheriff. The tank sealed from the outside, but Bell still had his stun-gun. He switched the setting to “rearrange” and pointed it at the bolt. The mechanism disappeared instantly; it would reappear in a few minutes, but was gone long enough for the sheriff to step outside. He quickly bolted the door to the other tank, locking the mad scientist inside. Then, in a moment of inspiration, Bell placed the corpse of the dead cat on the floor of the tank he had just vacated. The counter had five seconds remaining; the sheriff held his breath through the rest of the countdown. There was a whirring noise and a flash of blue light. Then the body of the mad scientist slumped over and fell to the floor. Bell watched as the cat, tail held high, pushed open the tank door, leapt out, and sauntered out of the cave.